“I can’t stand a thief!” I’ve heard this my entire life. After a brief education & extended research, this word developed a whole new meaning for me around a year ago. I’ve learned that not all Thieves are bad. Yes, you read that correctly. 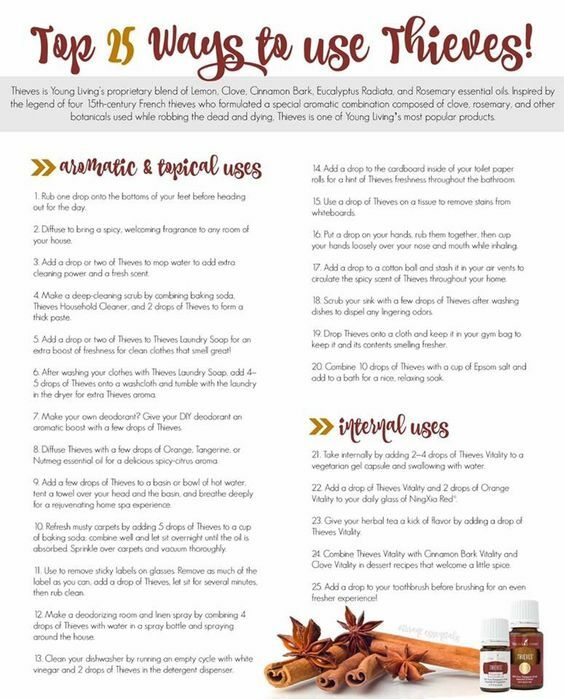 The Thieves Essential Oil is actually a wonderful multipurpose oil. Lately, several have asked questions concerning this oil; thus the reason for this article. Upon breaking down the benefits of each oil in this blend, you will quickly understand why this blend is so important to not only immunity but daily life as well. Research shows that Thieves Oil has a 99.96 percent kill rate against airborne bacteria. It was proven to be highly anti-infectious, antiviral, antibacterial and antiseptic. This essential oil is truly a potent and powerful natural home remedy. It strengthens all of the major systems of the body, including the respiratory and immune systems. It supports the body in fighting off infections and in its ability to protect against illness, both viral and bacterial. It can be used topically, internally, diffused, as a household cleaner, hand sanitizer, fruit & veggie cleaner and cough suppressant as well as many more uses. To say the least, it is a valuable commodity at our house! If you would like more information on this product, please feel free to contact me. Well, I am back! A friend asked why I was missing in action. Depression & anxiety are real! Very real! He encouraged me to talk about it with each of you. “Be kind to everyone you meet. You have no idea what they may face in their lives.” Gosh, I’ve heard this my entire life. Each year, I realize this more. I guess wisdom does come with age. Everyday, we face battles unseen, battles in our mind. Some struggle with this worse than others. It may be triggered from the loss of a loved one, worry, financial struggles, difficulty in the work force, among other things. We come in contact with people from all walks of life, many different personalities on a daily basis. There is the older person that you hate to see coming because they will complain about everything wrong (and I do mean EVERYTHING!). Most of the time, these people have no one to talk to. You are their “Dr. Phil” for the day. Then there are the folks that are so happy that you want to slap the grin off their face…overly bubbly. You think, “There is no way anyone can be that happy everyday!” Well, you may be wrong or you may be right. Many people conceal their problems to the world. No one knows what they face. Demons from the past. Anxiety of the future. Depression for today. Is it ok to have an “off” day? YES! It is perfectly ok. But what about those that have a more difficult time pulling out of this rut? Where does this leave them? Do we encourage each other as much as possible, whether we feel like it or not? Or are we too busy tearing people down behind their backs? Are we too wrapped up in our own problems to care? You never know when a simple complement might turn the day around for the person in front of you. You never know when your words & actions may give someone the will to live or end their lives. Please remember what we learned as a child, “Do unto others as you would have them do unto you!” A warm hug & a kind word goes a long way. It also makes you feel better in the process. It never fails. No matter how tired I am, how much I am struggling to stay awake, I become bright eyed as soon as my head hits the pillow. I count “To Do List” items rather than sheep. Since I am figuring out there is an essential oil for just about everything, I started researching oils that promote sleep. This is the recipe I came up with. Finish filling the bottle with a carrier oil. I rub the oil recipe on the bottoms of my feet every night, and this has helped tremendously. I can not wait to hear your results! Around the South, you can count on having 3 bowls of certain foods for potluck meals: Peas, Cornbread, Fried Chicken, Chicken & Dressing, Creamed Corn and Chicken Spaghetti. Never fails! I assume that Chicken Spaghetti is a popular choice based on the fact that it is a cheap one dish meal. Although it contains milk products, it otherwise fits perfectly into our diet. Boil 1 Springer Mountain Farm Hen. I use SMF because it is all natural & you can certainly tell the difference in the quality, taste & texture. When I boil it, I add 1 diced onion, 3 stalks celery, garlic, salt and pepper. Thaw a small bag of frozen carrots and English peas. Boil your noodles & drain. Return the noodles to the same pot after you have rinsed it out & add 1 Tbsp. Olive Oil. Let the chicken cool, de-bone it & add to the noodles. Add 1 cup chicken broth & set the rest aside. Dice garlic, 1 onion & 1 bell pepper. Then dump these and the thawed veggies into the pot. Open 1 can rotel (undrained) & one can whole kernel corn (drained). Add both to the pot. Dice 1/2 large block of Velveeta cheese (I prefer store brands over Velveeta) & add to the pot. You do not want this dish to be dry, so add more chicken broth to reach the desired consistency. If you do not add enough liquid, the cheese will be very dry the following day. Freeze any remaining chicken broth for later use. Natural Bone Chicken Broth has many uses, and it is great when you are fighting off an illness. Serve with garlic toast, corn bread or yeast rolls. So, not counting the onions, peppers, chili peppers from rotel and garlic, this dish includes 5 veggies (corn, English peas, carrots, tomatoes and the veggie your noodles are made from). You have a serving of meat & a serving of milk as well in this dish. The garlic and bone broth have many health benefits, and the kids love Chicken Spaghetti simply because they think it is an upscale version of homemade mac & cheese. It is a Win Win for everyone! Add 1 drop lavender to your mascara. Benefits: Great smelling, prevents clumping, smooth application, helps sparse areas in eyelashes to grow within 3 weeks! This is for you, Patricia! Hope you enjoy! Place onions and carrots in the crock pot. Rub pork roast with seasonings. Place roast on top of veggies & then add water. Is makes great tortillas as well as a main course meat. Nothing compares to the smell of fresh baked goods coming from the kitchen during the holidays. I remember my mom & dad spending hours preparing for Thanksgiving & Christmas meals. The most vivid memories are Mom’s homemade chocolate chip cookies & Dad’s roasted peanuts. It is amazing how smells or words bring back precious memories! Make a well in the center of the dry mix and set aside. In a separate bowl, combine the eggs, oil and vanilla. Once well combined, add in the apples and nuts to this flour mixture. Stir until moist; the batter will be thick. Spread onto the baking pan. Bake for 50-55 minutes or until completely cooked. This is great with cream cheese icing on top. However, I have served it as a sweet bread for a light breakfast. This is usually a hit during family dinners.